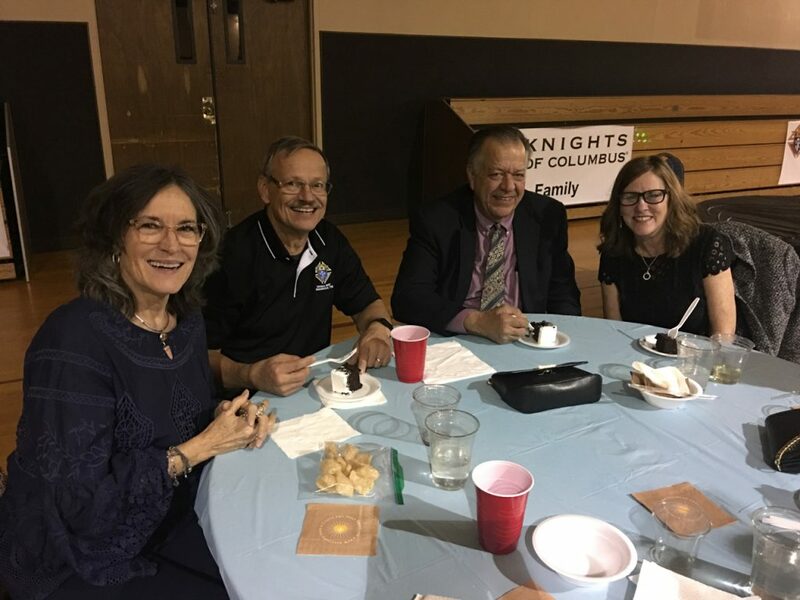 Once a year our council gathers to show our appreciation to our member knights and their spouses for all the hard work they contribute throughout the year. 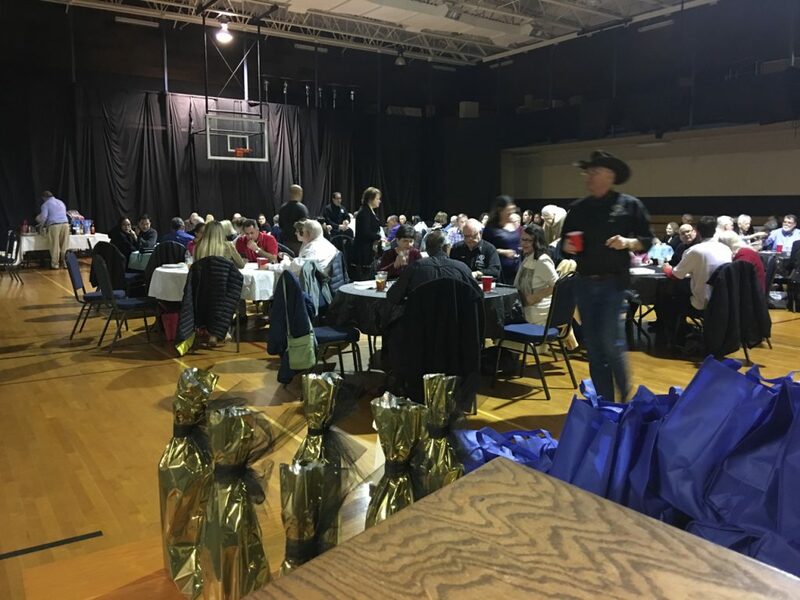 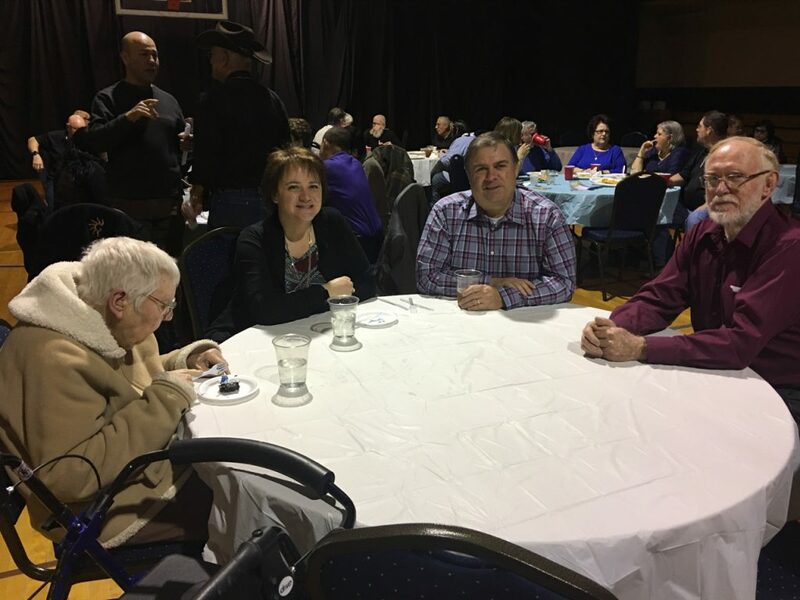 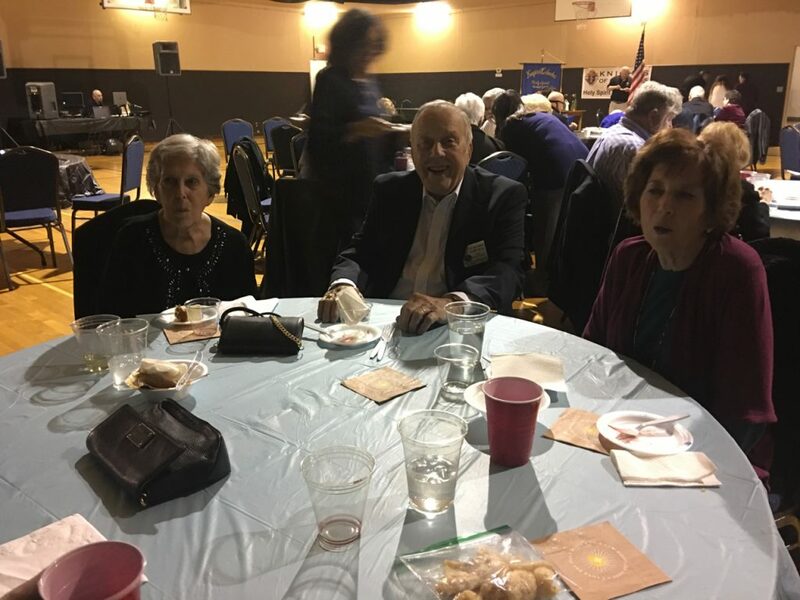 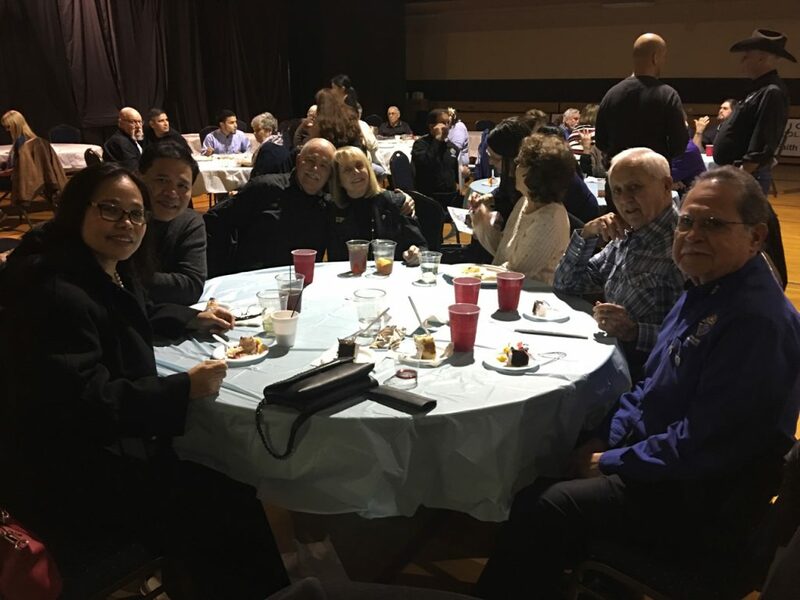 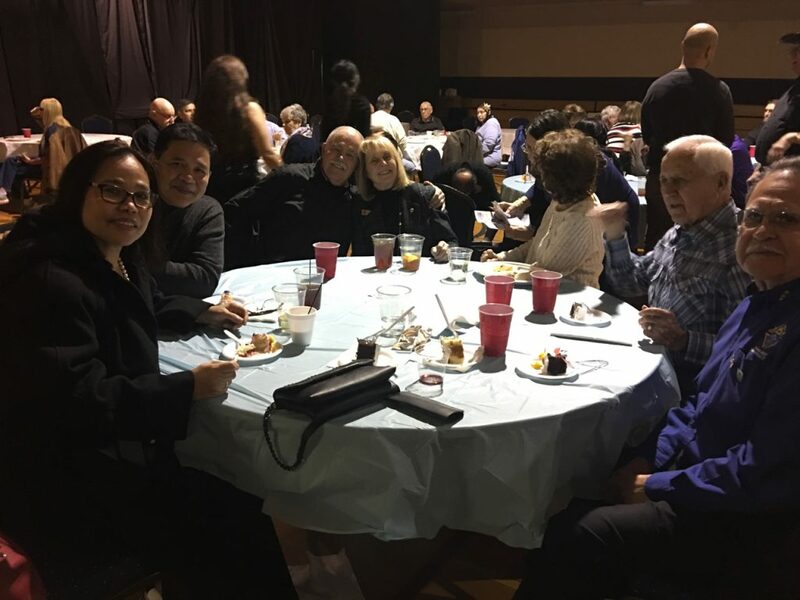 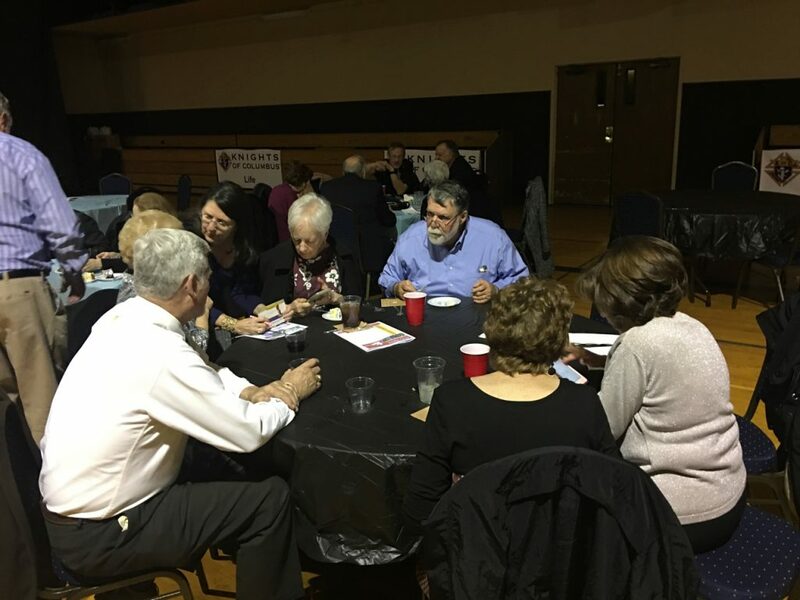 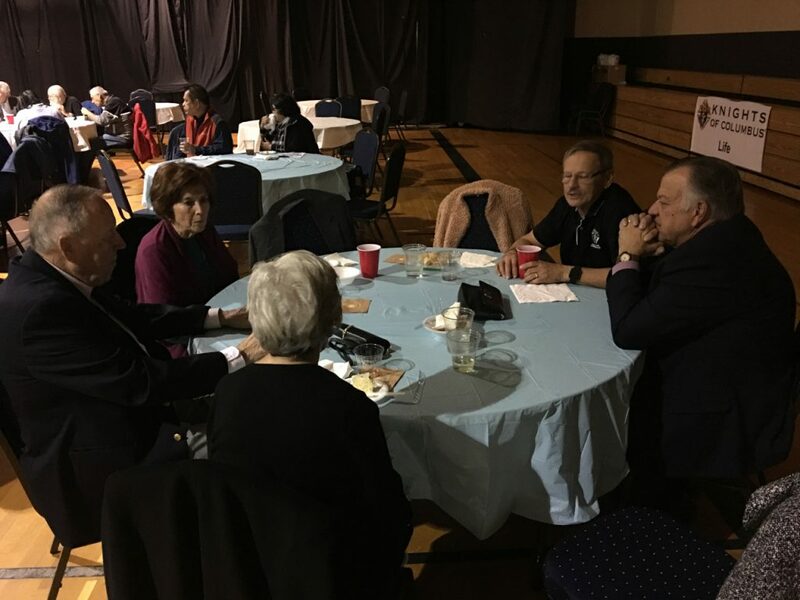 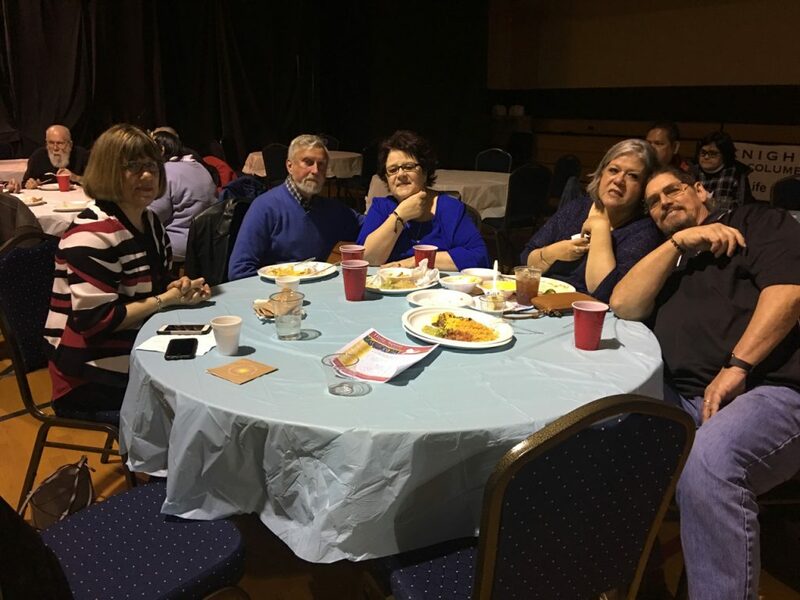 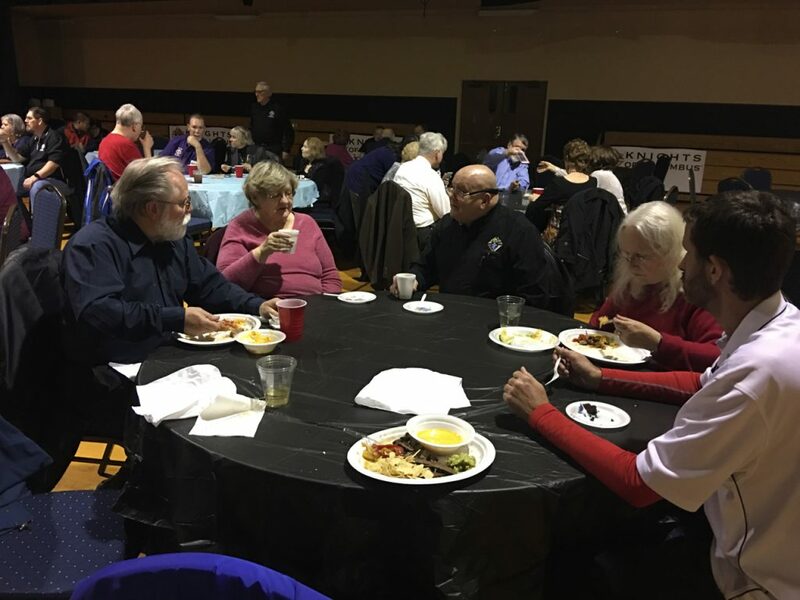 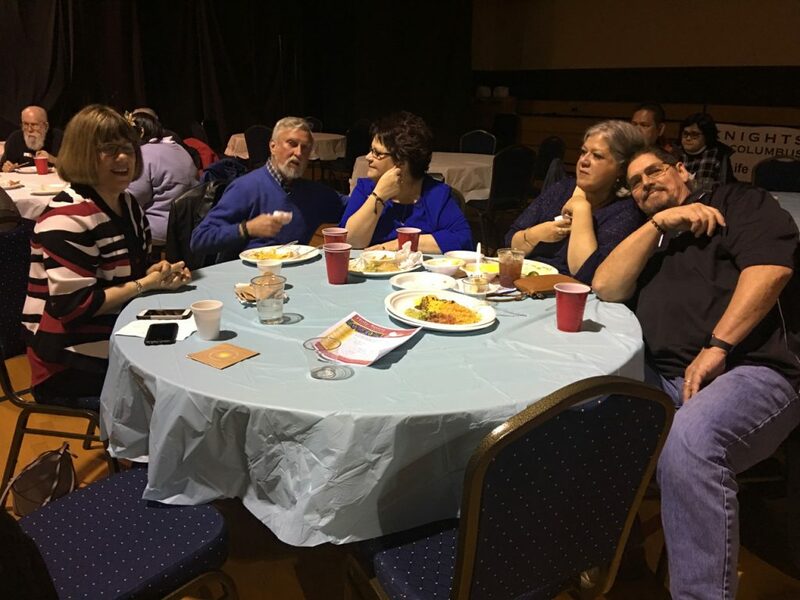 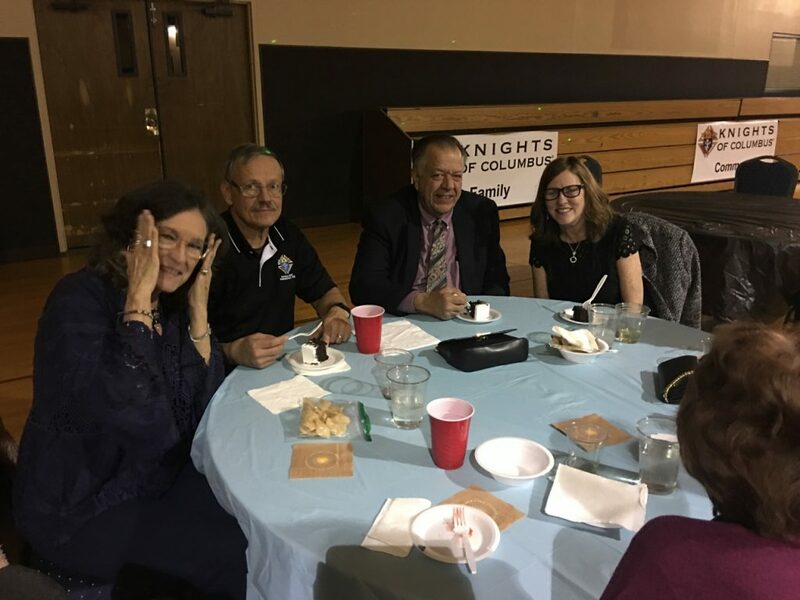 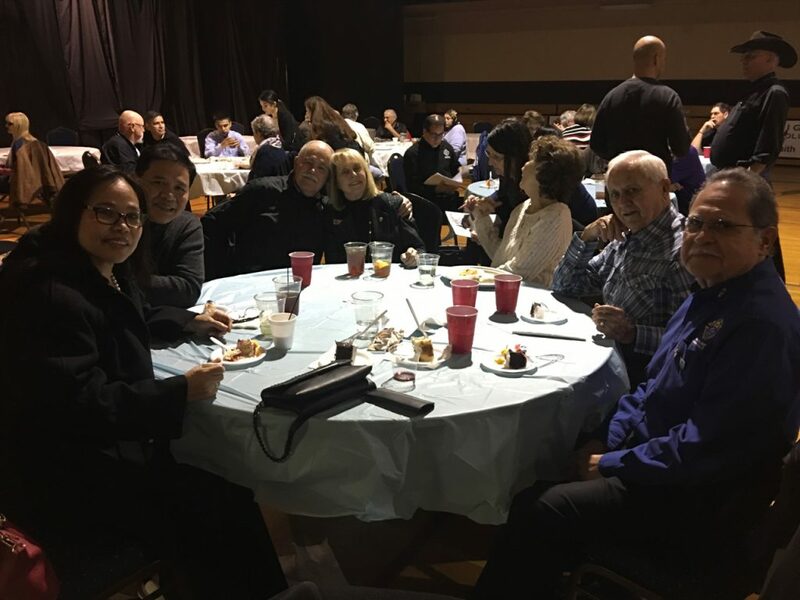 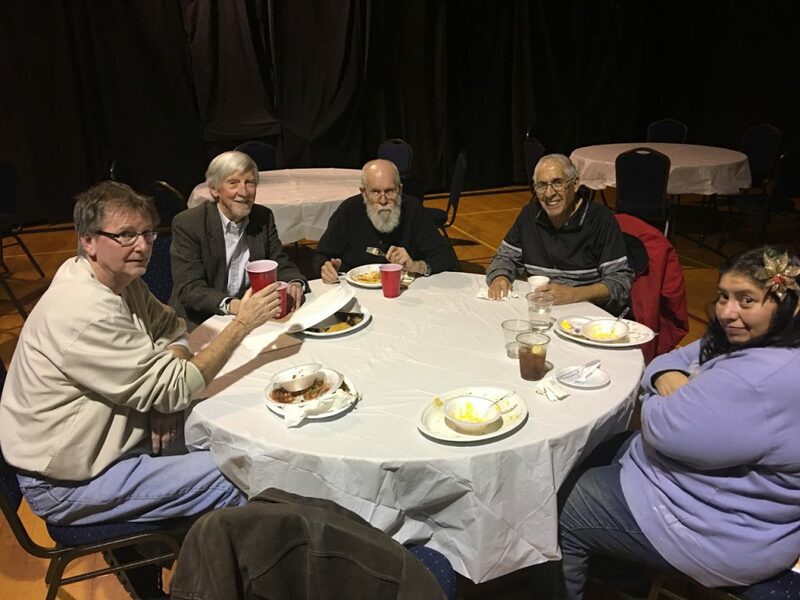 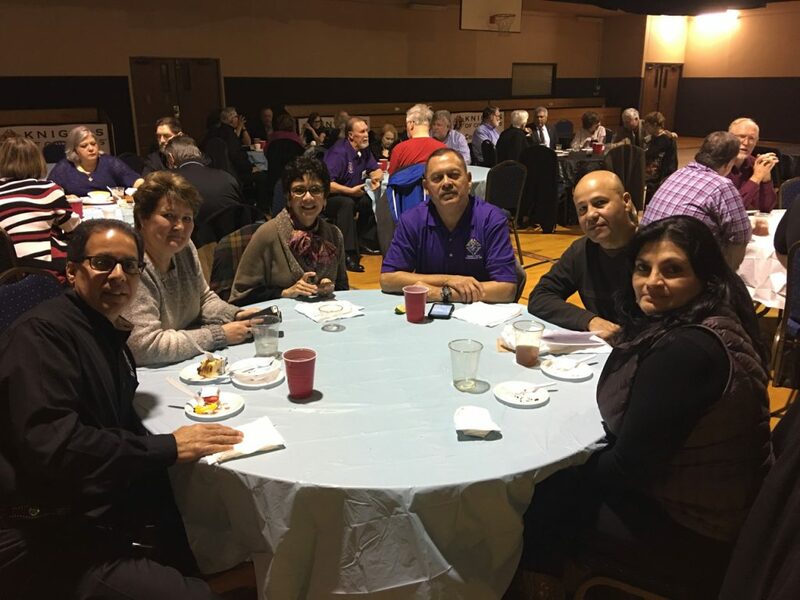 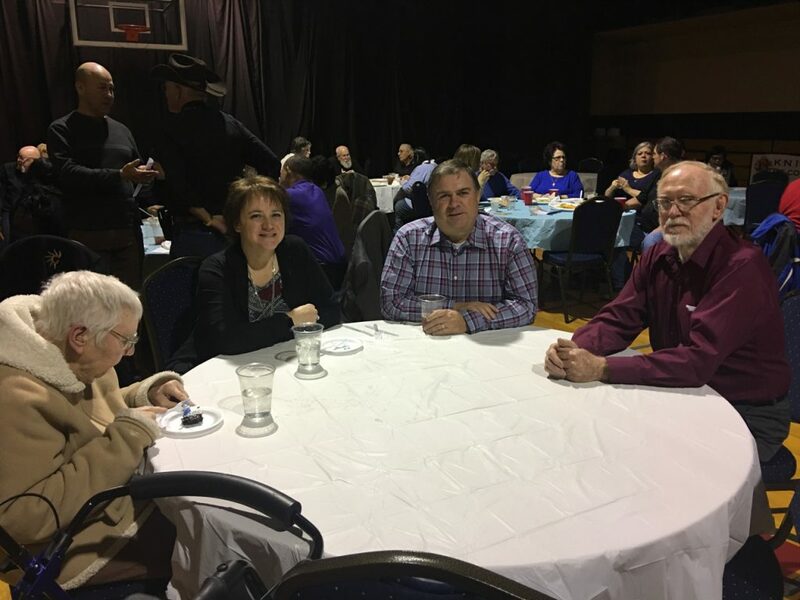 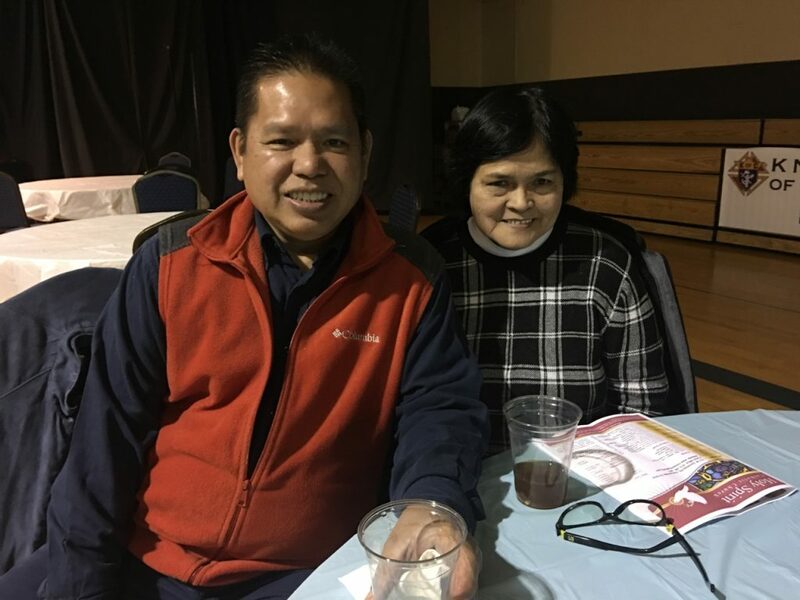 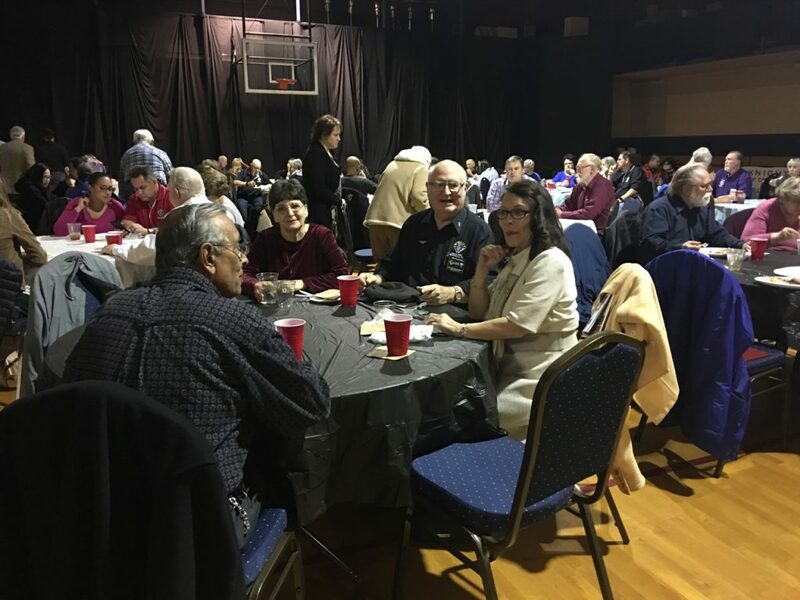 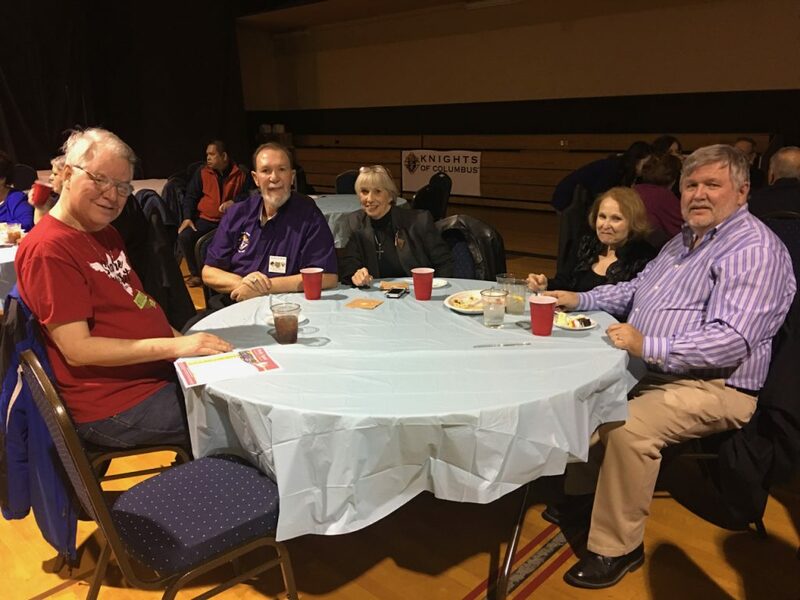 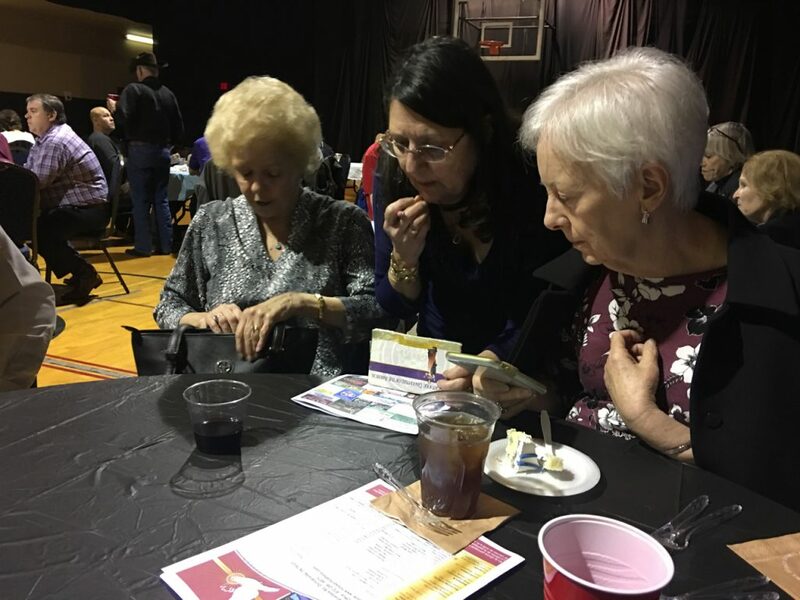 This past Saturday evening, on January 12, 2019 we attended our Corporate Communion Mass which was followed by our annual appreciation event. 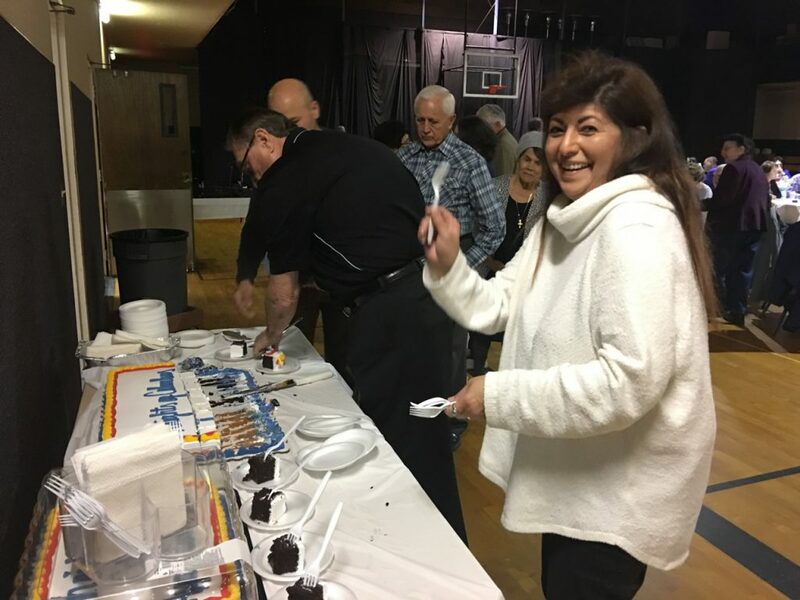 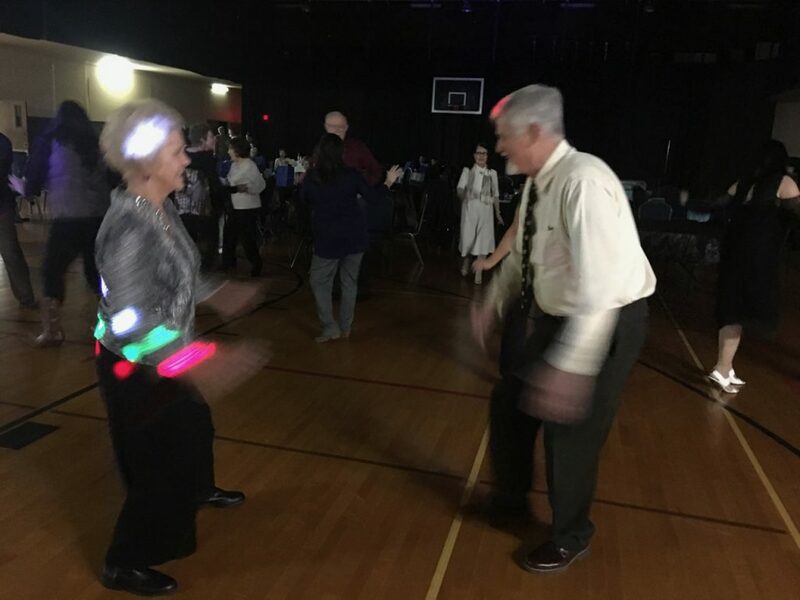 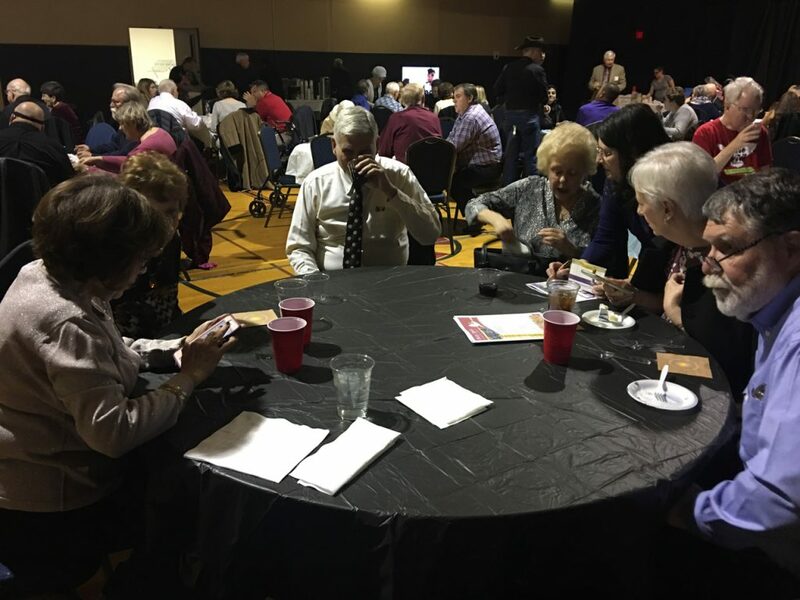 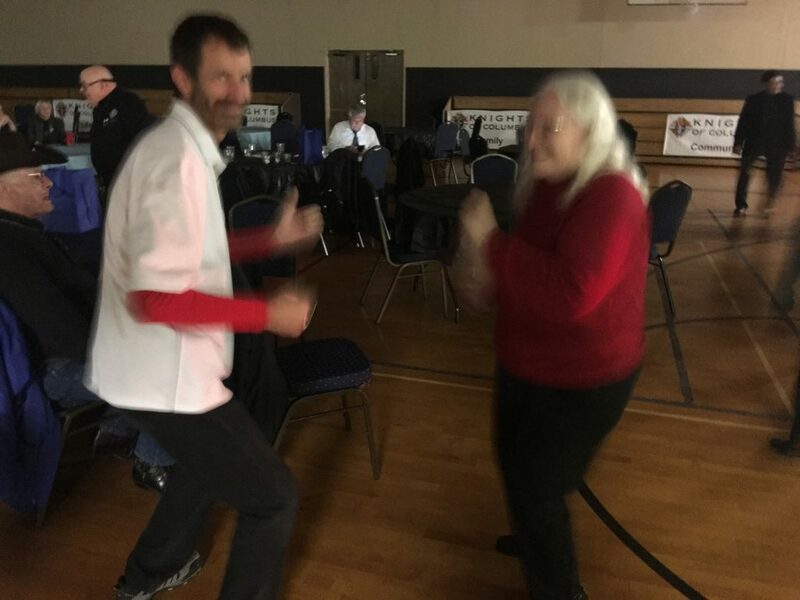 The event is always free of charge for our members and their spouses of course and includes dinner and dancing, beer and wine, special recognitions and door prizes. 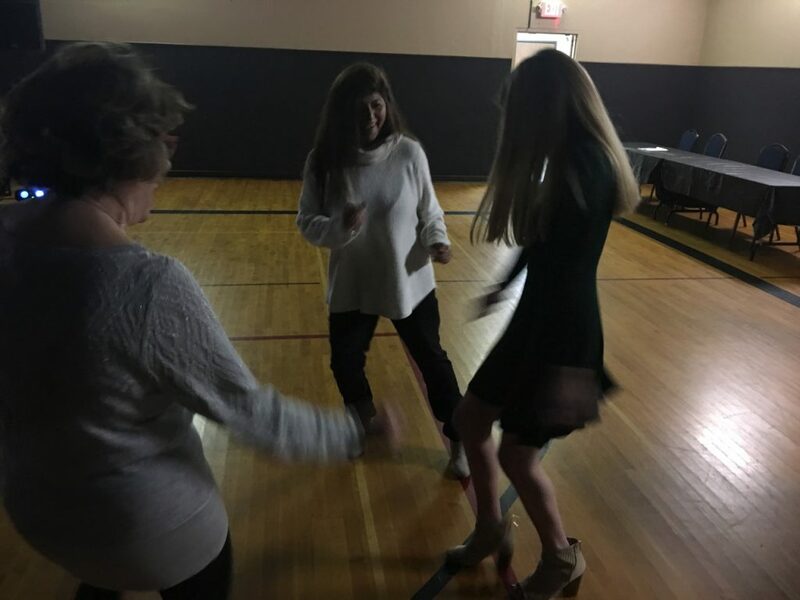 It’s always a great way to kick off the new year. 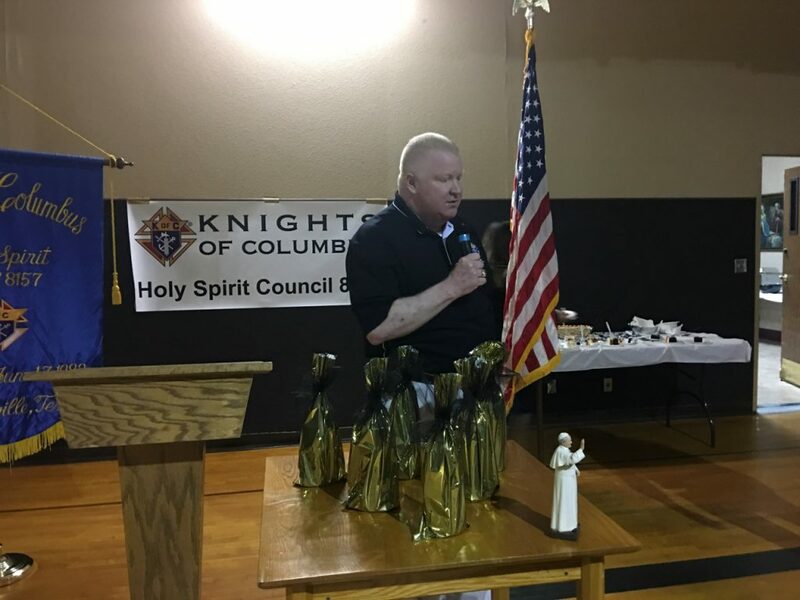 Our Council Activities Director and MC for the evening, SK Andy Goza did his usual outstanding job coordinating and making all the necessary purchases and preparations for the amazing dinner, the open bar and the DJ dance music entertainment. 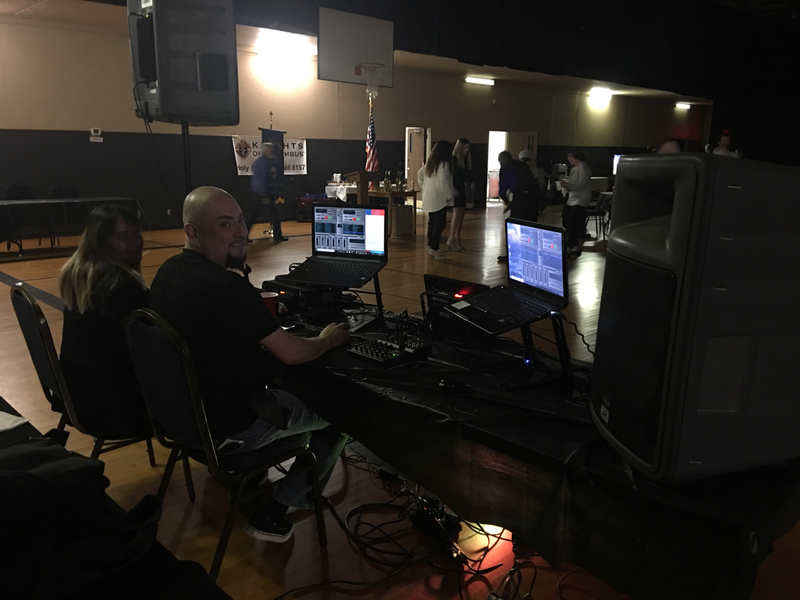 Andy even went as far as setting up a TV screen broadcasting the football playoffs game live between the Cowboys and the LA Rams. 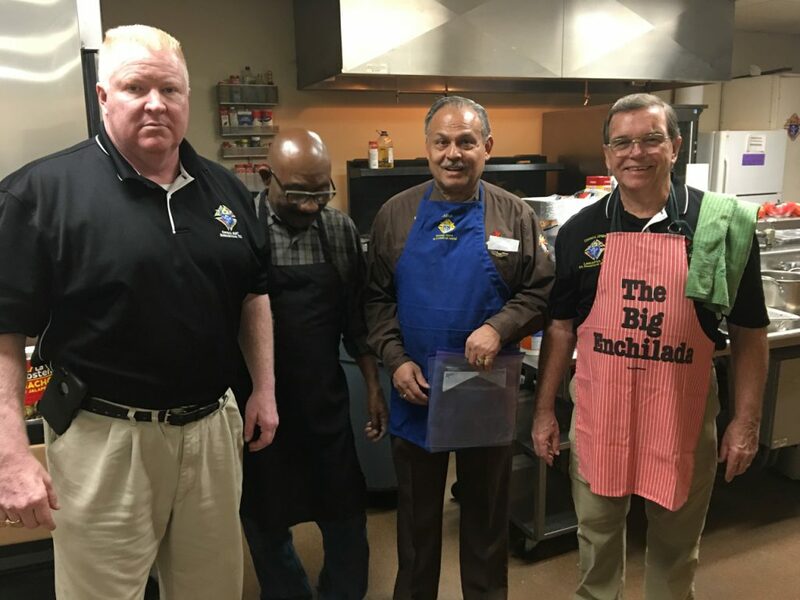 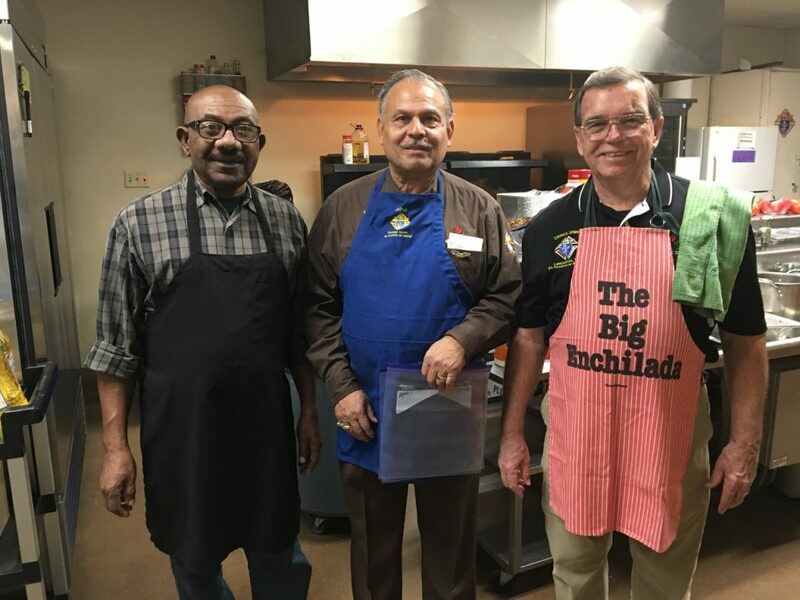 The Tex-Mex dinner was a big hit again this year, consisting of beef and chicken fajitas (which John Espree and Andy spent hours grilling Friday night), grilled tri-color peppers with onions, Mexican style yellow rice and refried beans and of course the delightful guacamole dip. 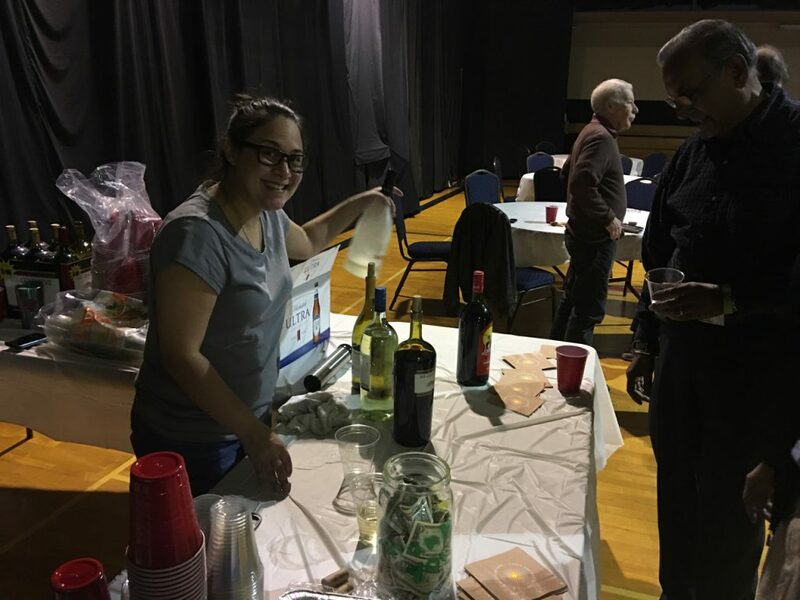 The open bar was again professionally handled by our trusted bartender Ms. Leah Gomez whom we can always count on to keep our beer cold and our wine glasses full. 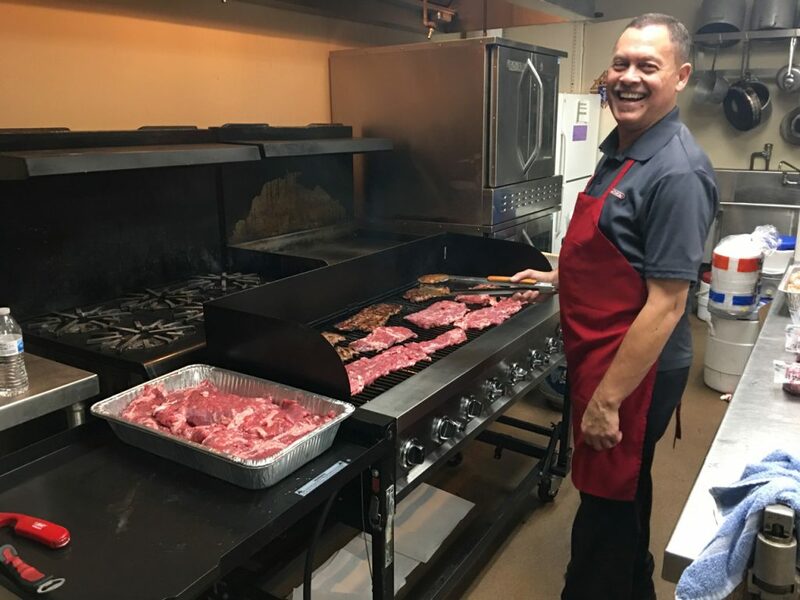 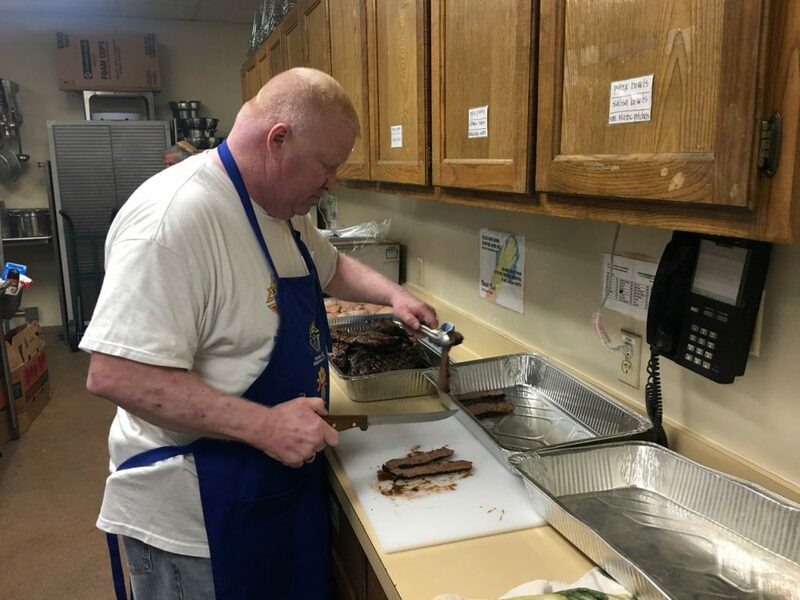 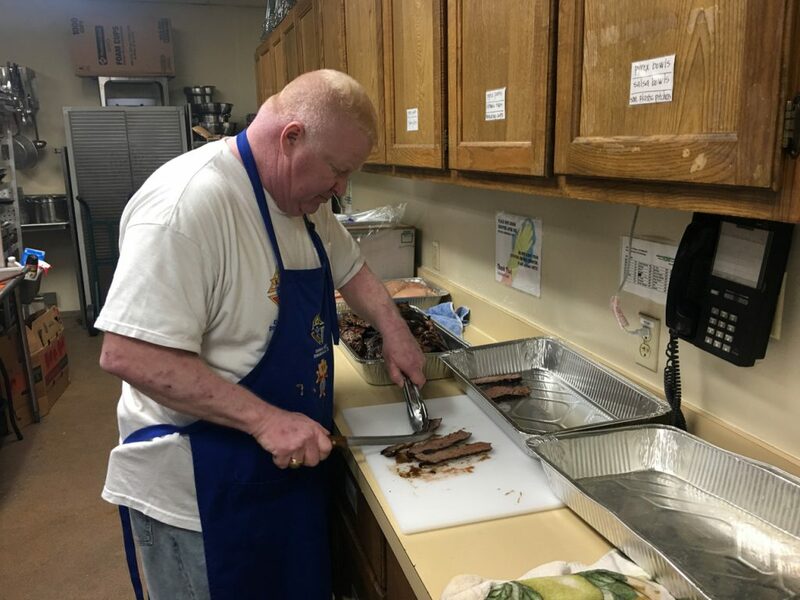 Andy also recruited the evening’s dining service and clean up help from our neighboring Lancaster council of St. Francis of Assisi Catholic Church. 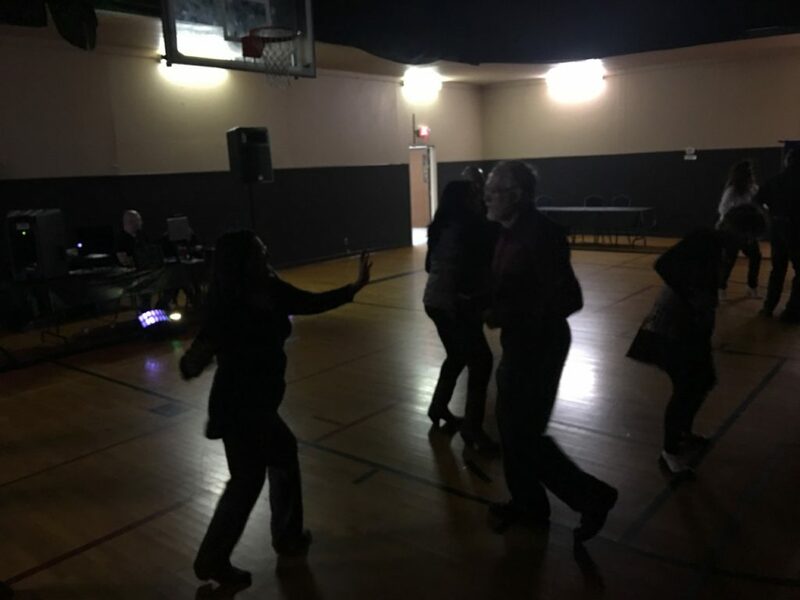 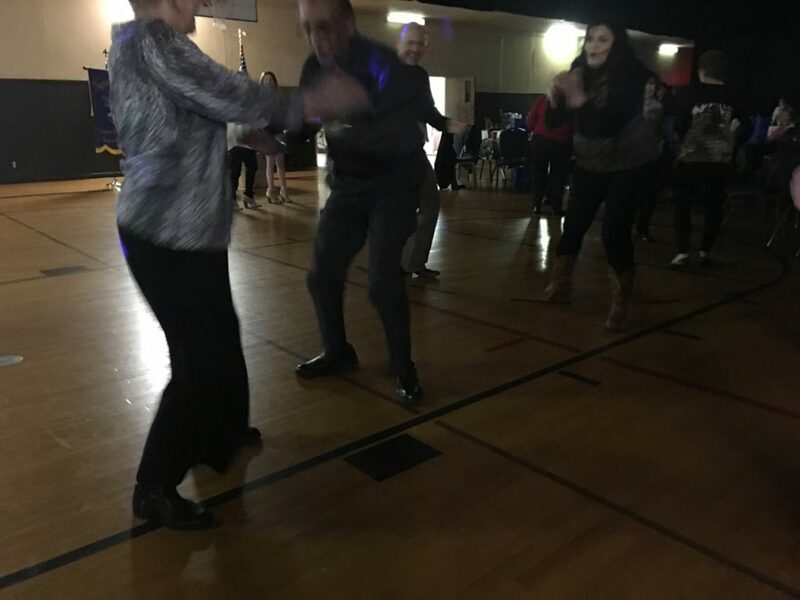 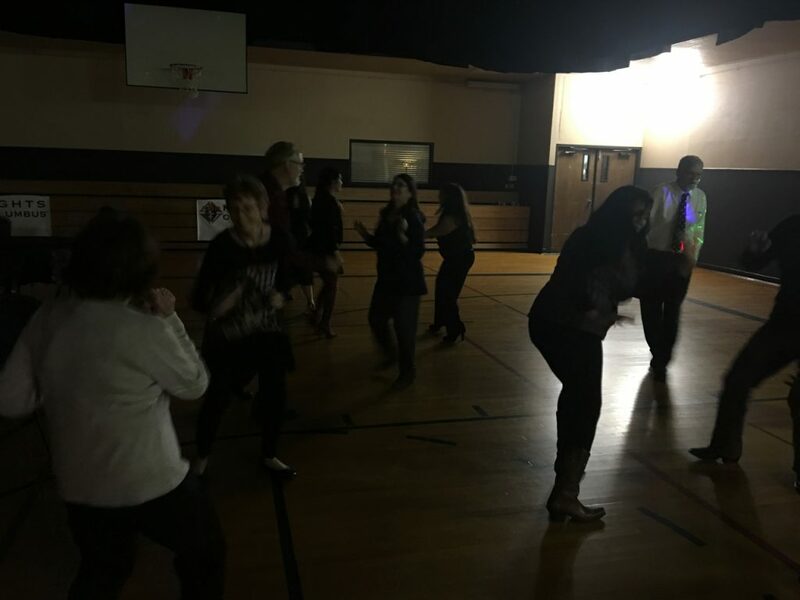 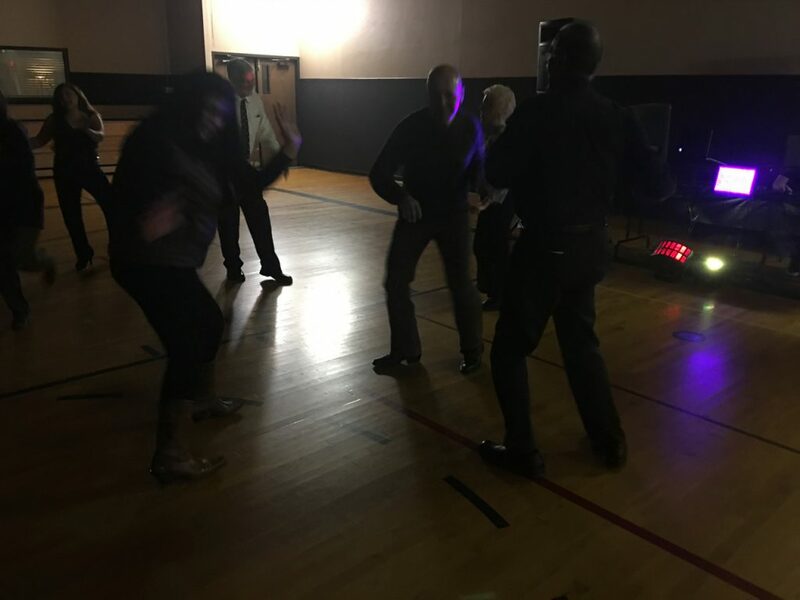 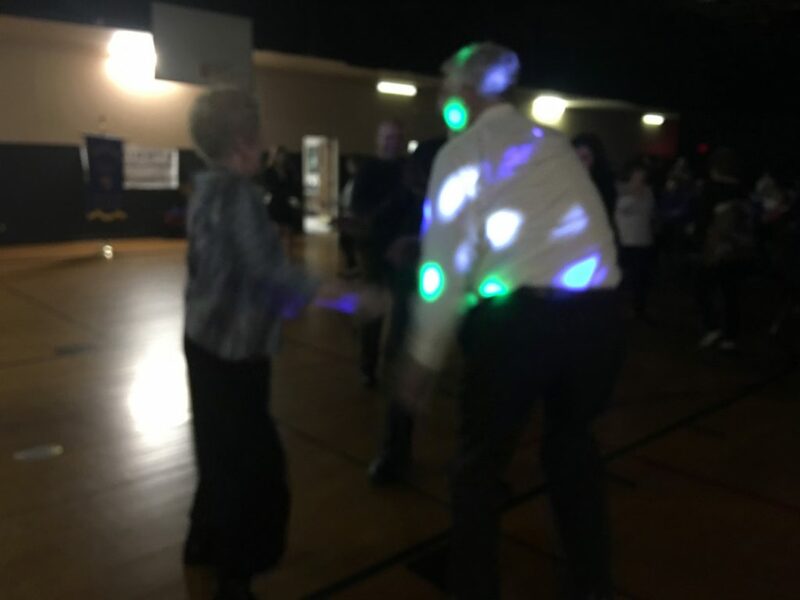 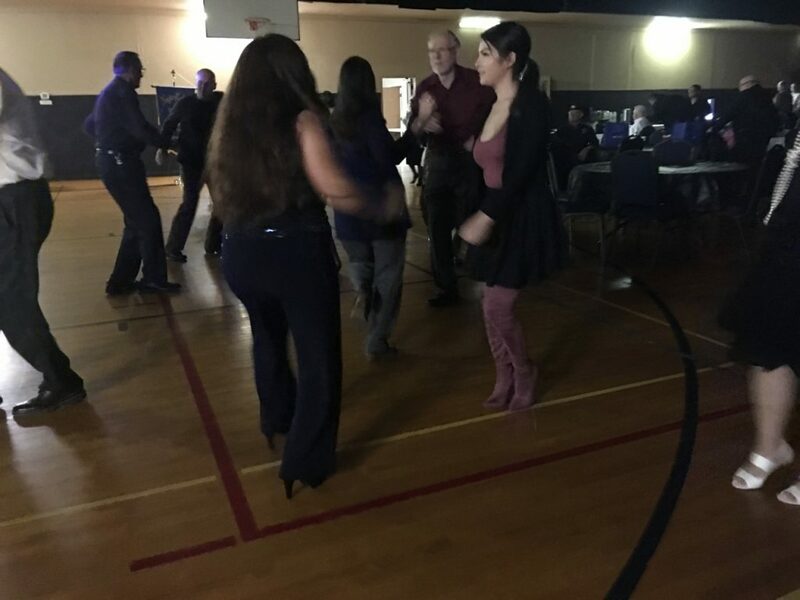 A huge thank you to Grand Knight Oliver Dacey Jr. and Financial Secretary Julius Semien and company from council #12484 for doing all the hard work, which allowed the rest of us to be free to just have fun tonight. 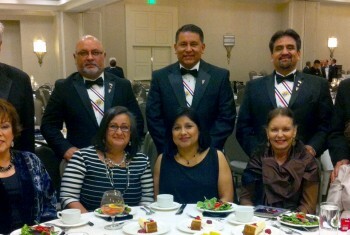 Lancaster Council 12484 St. Francis of Assisi. 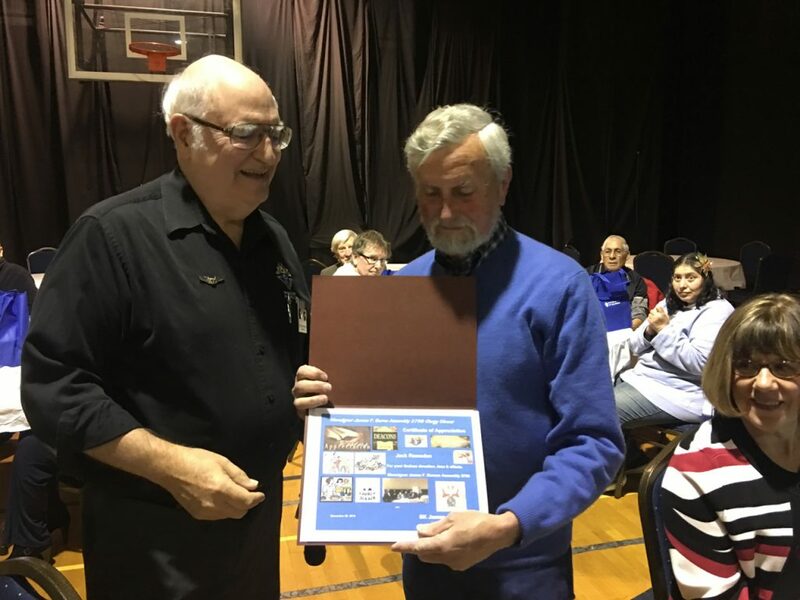 The January 2019 Knight of the Month award was presented to John Balasa by Grand Knight Tom Greco. 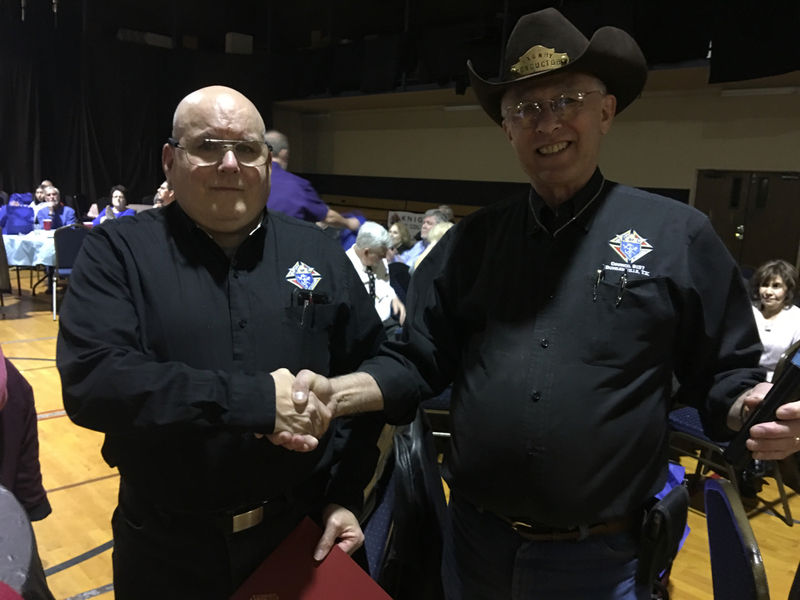 There were two special awards that were earned by two of our most worthy and distinguished knights. 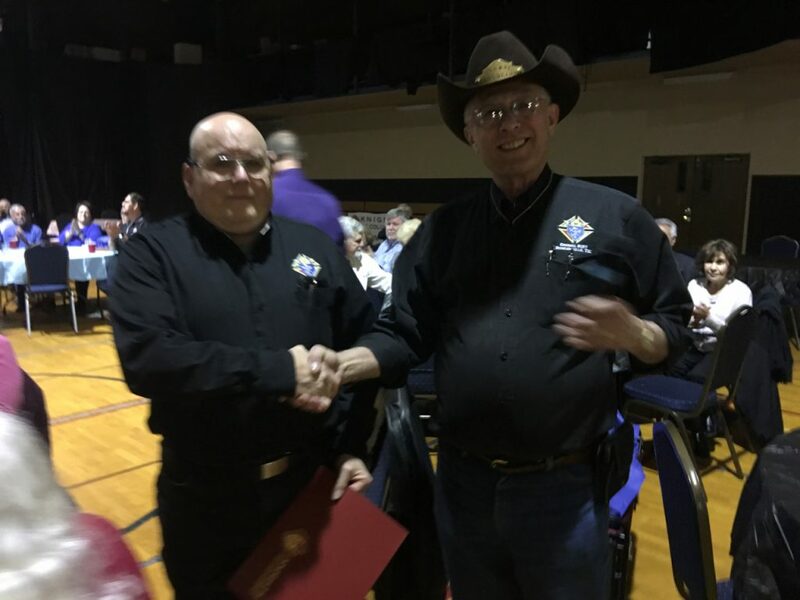 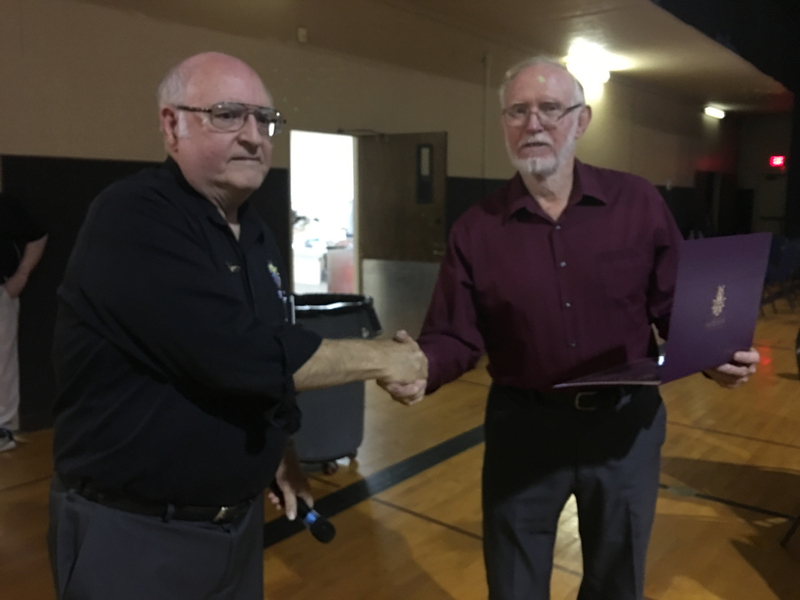 SK Larry Balagna and Jack Ramsden were both recognized for their help with the Fourth Degree Clergy Appreciation Dinner with certificates of appreciation for their selfless devotion and loyalty to the council. 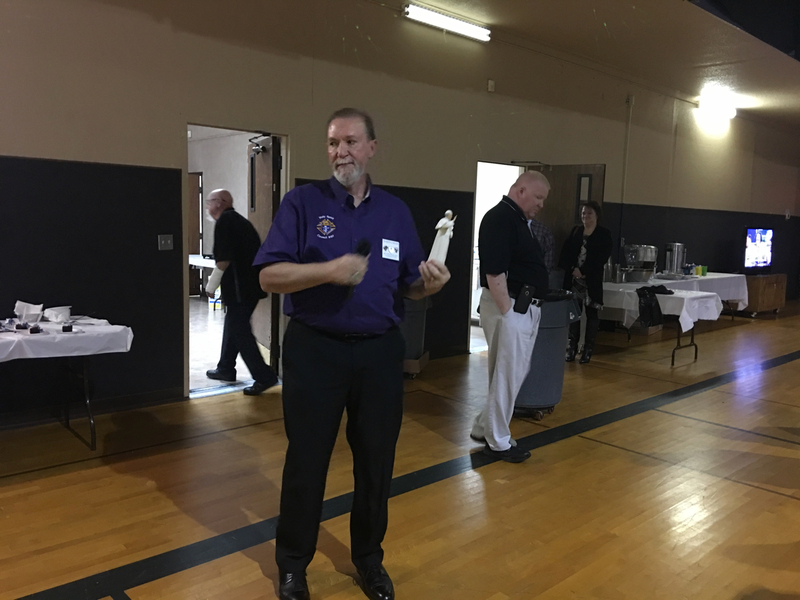 Larry and Jack are highly motivated self starters who are always steps ahead of everyone else, no matter what the project may be. 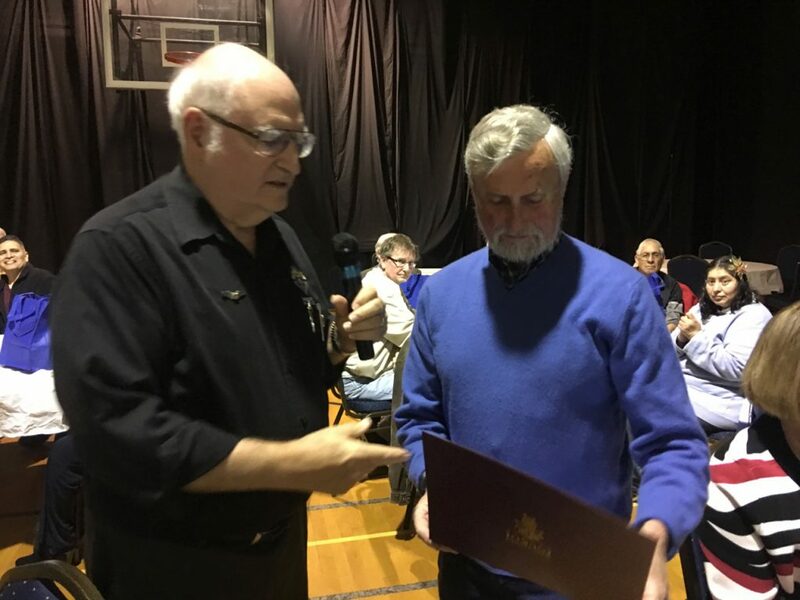 SK Larry Balagna receiving certificate of appreciation from FN Jim Russell. 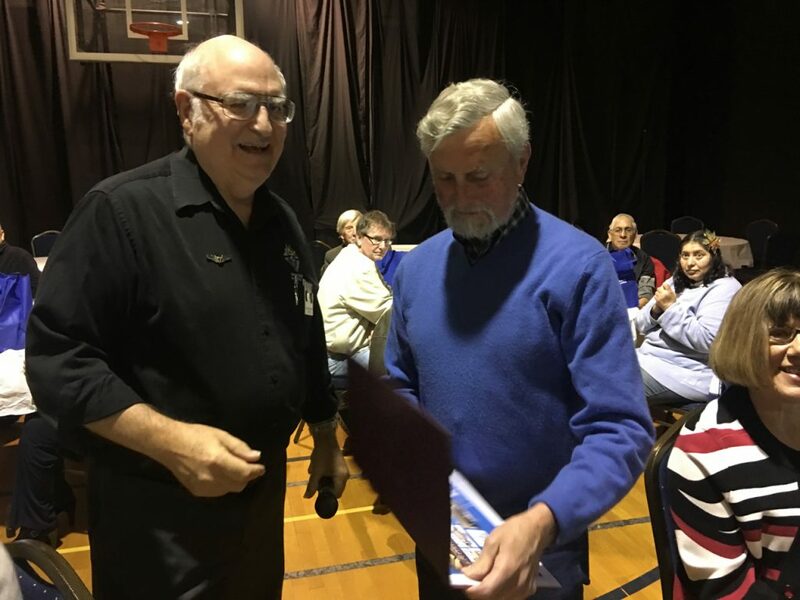 Jack Ramsden receiving certificate of appreciation from FN Jim Russell. 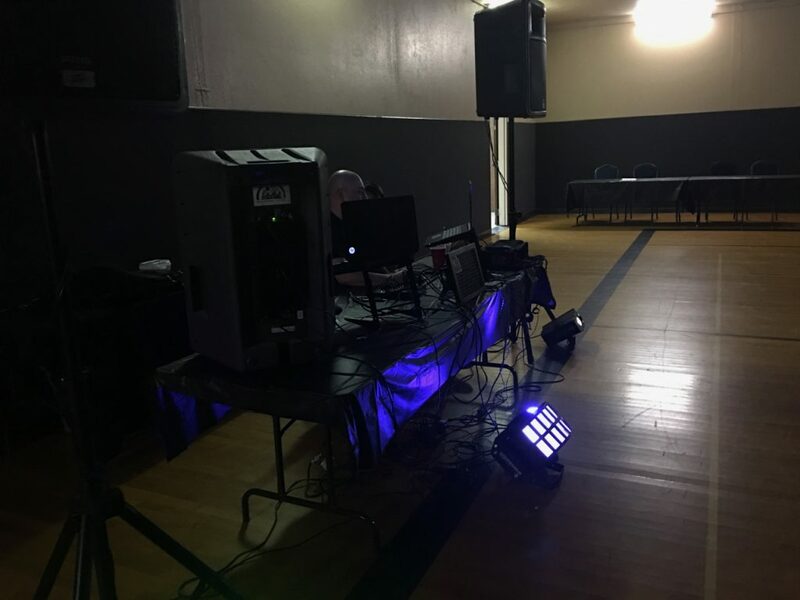 The musical entertainment that was provided by high tech DJ Daniel Arce (just look at their setup) proved to be the big hit of the night as the dance music spanned genres, generations and cultures and kept the dancers on the floor late into the night despite the fact that there was a football game being shown on screen on the other end of the dance floor. 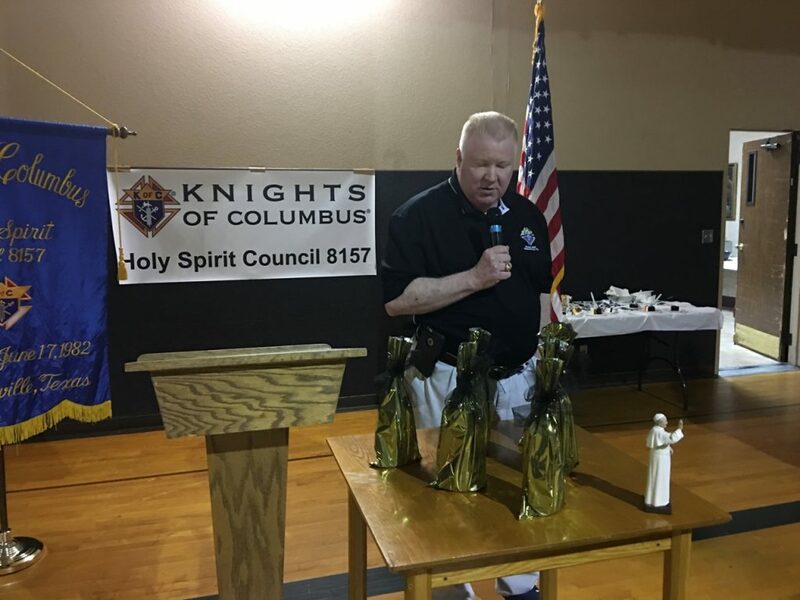 Wine bottles were later awarded as the prizes to the dance contest winners in several different categories. 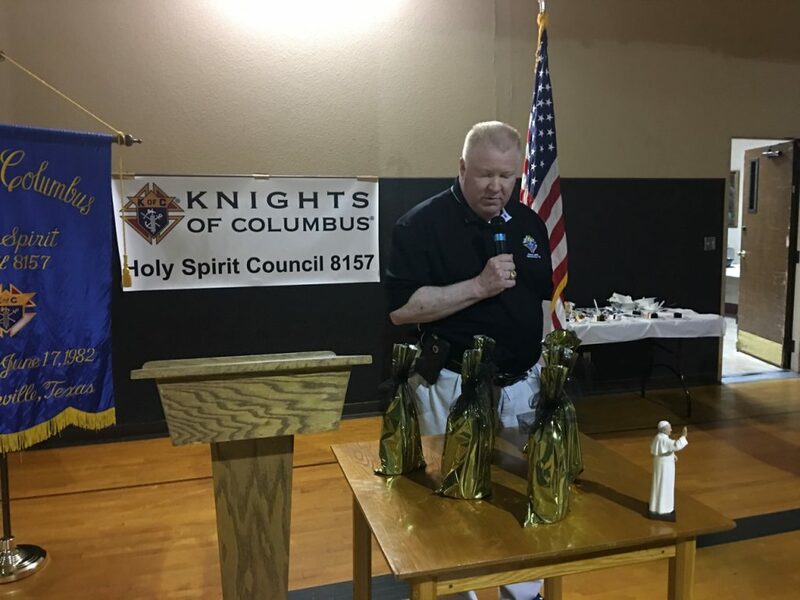 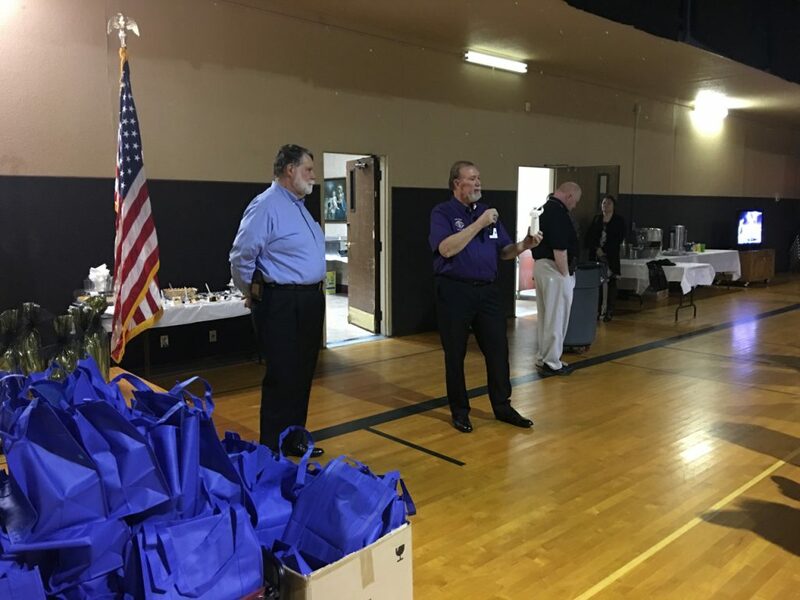 SK Keith Archer surprised all of us when he asked Deacon Al Evans to bless several bags containing Pope Francis statuettes which he had purchased and paid for himself. 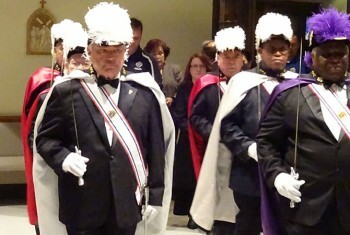 Keith then presented them as gifts to all the knights present. 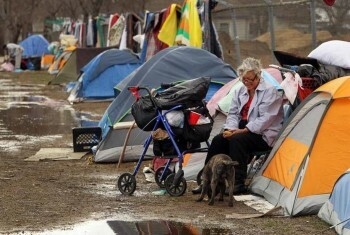 Keith, on behalf of the council we want to thank you very much for that amazing gesture of generosity and appreciation. 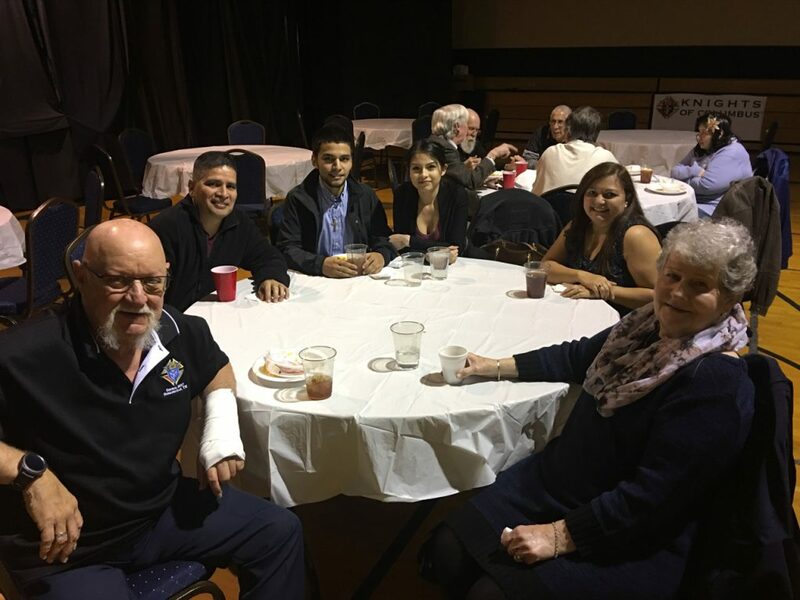 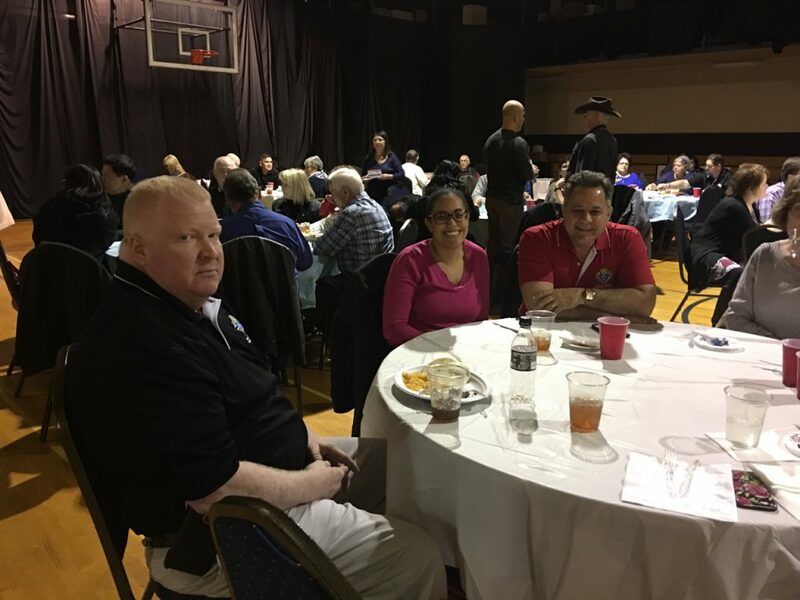 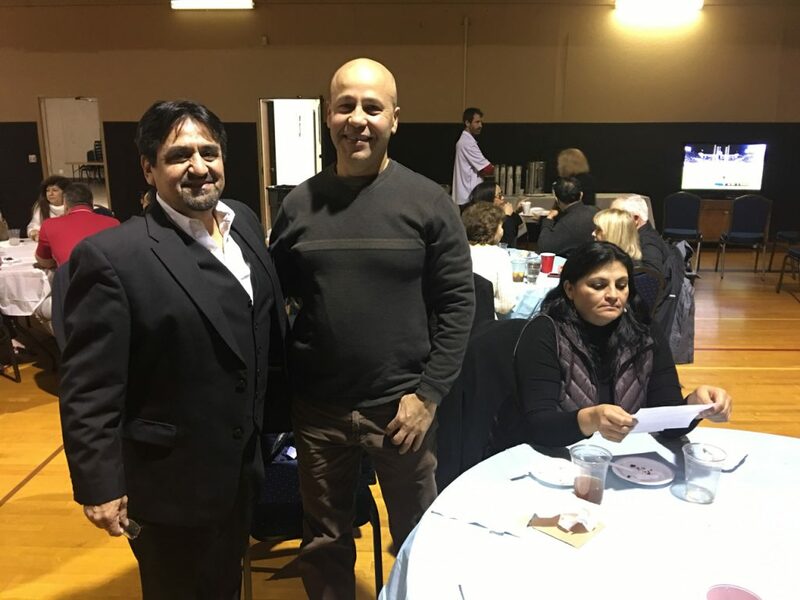 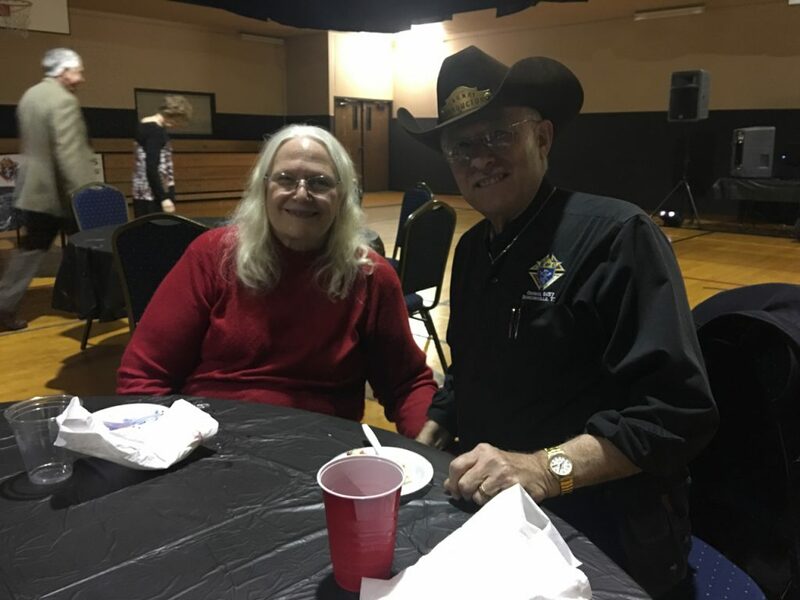 We also had a special guest this evening as Francisco Cisneros and his wife accepted Allen Reitmeier’s invitation to attend the dinner/dance after he assisted with a Knight Hands job where he provided his services pro-bono. 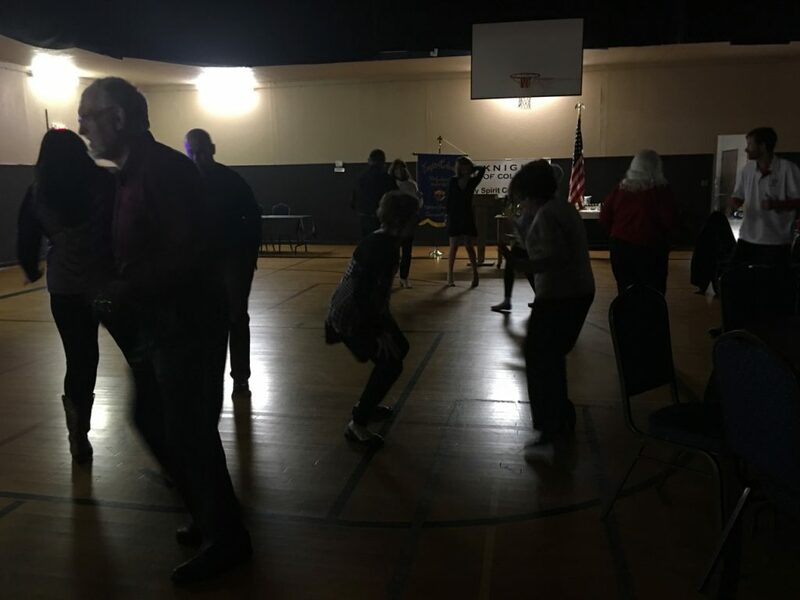 And dance they did, and they did it so well in fact that it earned them a vintage wine bottle from Andy’s cellar. 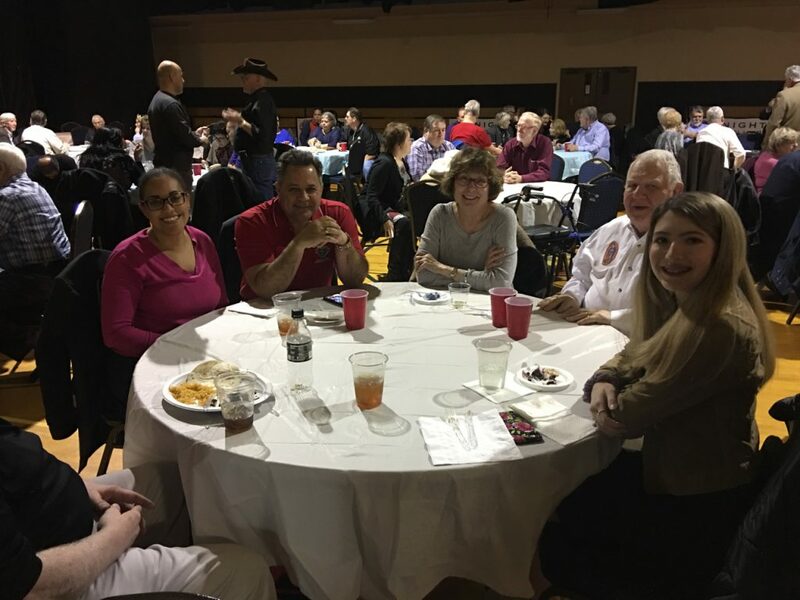 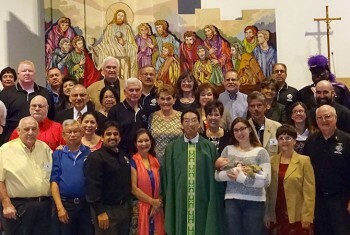 We wish to thank all 88 guests for attending and breaking bread with us but most of all we thank you for your loyalty, dedication, generosity and everything you do to contribute to help our council remain worthy of having been named the Council of the Year of the Dallas Diocese Chapter last year. 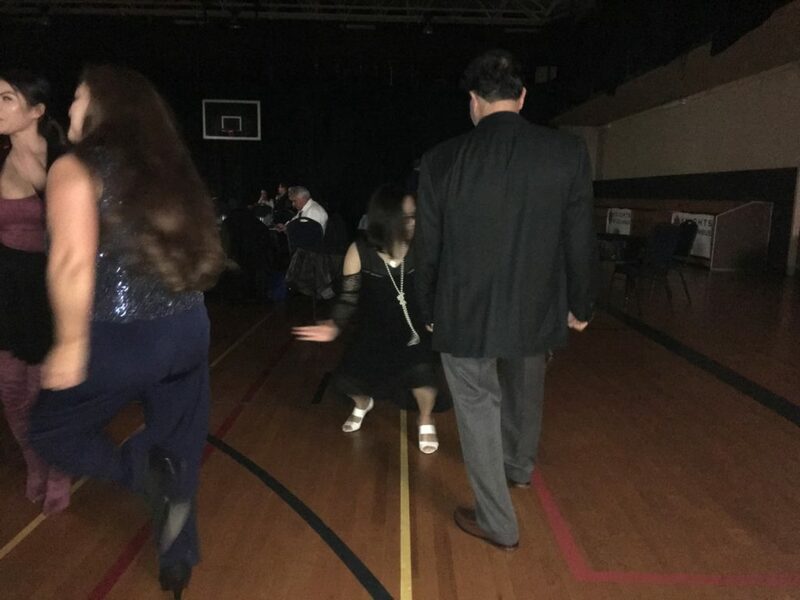 Until next year then.